Windows 7 comes with quite a few out-of-box themes, which you can access from 'Personalize'. There are more official themes available too from the Microsoft Windows 7 website. You can also unhide & reveal the hidden themes in Windows 7 ! You can also check out the excellent collection of Windows 7 themes FOR Windows 7 from ithinkdiff. Take your pick ! Simply download them and click on them to install ! Worth a checkout ! Do check out Post#10 below. Cool. I will be checking them out tomorrow. Are all these "Themes" just a wallpaper and window color or do they also change system icons, task bar, start menu, ect. like XP themes. It easier to install themes in win7 than in vista. thanks bro, will check 'em out. 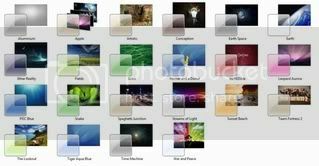 Sadly, except for one theme on ithinkdiff.com , all the other themes don't even had a slideshow of the wallpapers! Just one wallpaper. I had expected better from microsoft, but atleast 15 new themes is a start! Don't worry!! I will be releasing some good themes shortly..
those are some sweet walls there. I was able to open the themepack files with powerarchiver and apply them in Vista. Its almost easier to apply these themes than to try and duplicate the color manualy.